I don’t have the habit of eating cereal since young hence after a few months eating granola for breakfast (see my peanut butter and chocolate ones), I stopped because I wanted a break from it. When the craving for granola came back again, I decided to make a different flavour of granola, just so I have new recipes to blog about! I stumbled upon a vanilla granola recipe and I absolutely love the simplicity of it. Vanilla granola may sound a bit plain – yes it’s simple, but it’s definitely a classic. The oats and nuts are coated with a light vanilla flavour and sweetened minimally with maple syrup. I used a mix of almonds, peanuts, hazelnuts and pecans which I blitz briefly with my food processor. Each of these nuts retain their original nutty deliciousness as the vanilla did not overpower their nutty taste. Dried blueberries were added at the end after the granola was baked, adding a fruity sweetness and chewiness to the granola. So is it plain? Definitely not plain at all to me! To put together this vanilla granola recipe cannot be any easier – just dump, mix and bake (hence no step-by-step photos today). The key is to use a good-quality vanilla paste, the kind you will use in an homemade ice cream. My favourite brand is Nielsen-Massey, but you can use whatever brand that you like. If you can’t find vanilla paste, vanilla extract or even vanilla powder can be used instead, just make sure it’s of a good quality! I’m off to snack some granola, so I’ll leave you all with the recipe! Preheat oven to 150C / 300F (non fan-assisted), or 140C / 285F (fan-assisted). Line a baking sheet with parchment paper or silpat. Set aside. Combine oats, nuts, olive oil, maple syrup and vanilla in a mixing bowl. Stir to coat the oats and nuts well with liquids. Scrape the mixture onto the lined baking sheet and spread it out with a spatula until it's ¼-inch thick. 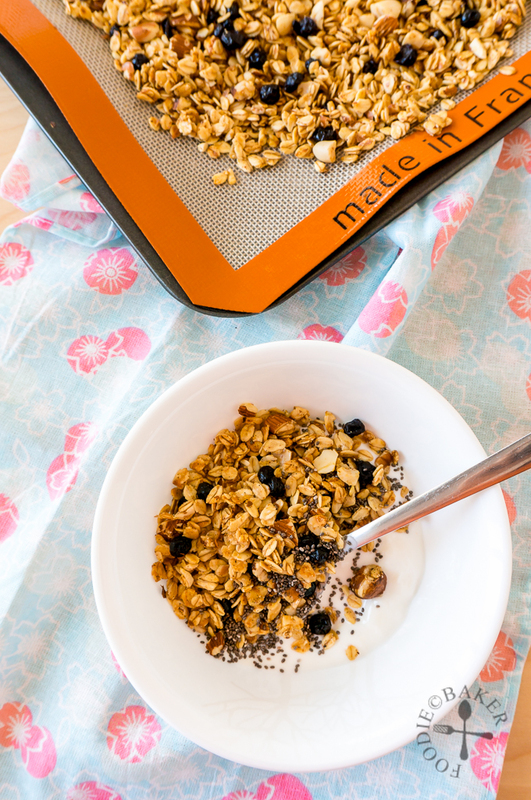 If your oven/baking sheet is small, bake the granola in 2 batches. Remove the baking sheet from the oven and stir in the dried blueberries. 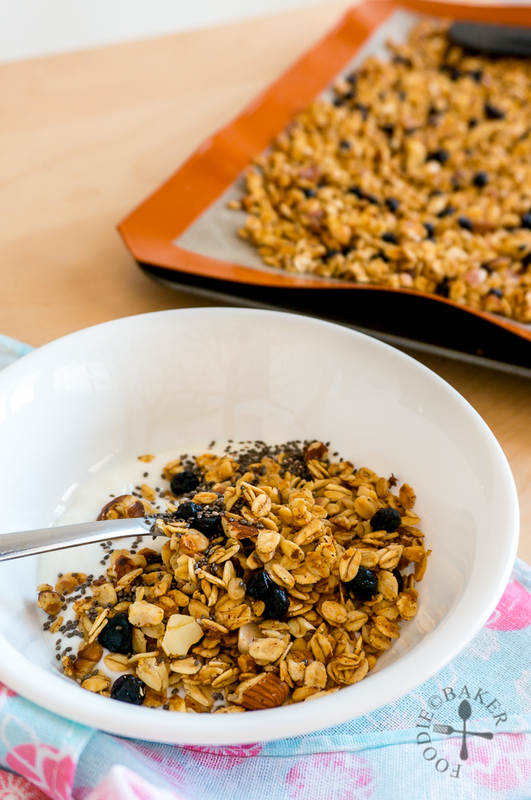 Let the granola cool completely on the baking sheet, it will harden and become crispy as it cools. 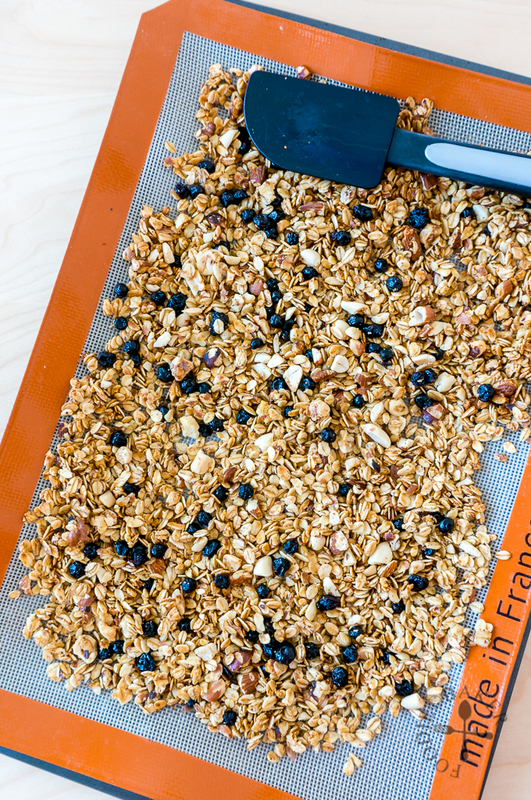 Store cooled granola in an airtight container at room temperature. I, too, was never a cereal person, Jasline, and granola was something I ate when snacking. Very rarely did I prepare a bowl of either for breakfast. I still don’t think one recipe is going to change a lifelong habit but, I will say, I’d love to have a bag of this with me the next time I’m heading out for a hike or walking tour. It sounds delicious! Like you, I’m not used to cereal breakfast too! But I don’t mind a good granola once in a while! These looks wonderful! Wow, speaking of dried blueberries! Looks great!